The system is capable of automatic detection and actuation and/or remote manual actuation. 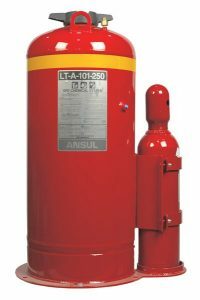 When a fire is detected, the A-101 system is actuated either manually or automatically, operating the pneumatic actuator. The pneumatic actuator ruptures a seal disc in the expellant gas cartridge. This, in turn, pressurizes and fluidizes the dry chemical extinguishing agent in the tank, ruptures the burst disc when the required pressure is reached, and propels the dry chemical through the network of distribution hose. The dry chemical is discharged through fixed nozzles and into the protected areas, suppressing the fire. 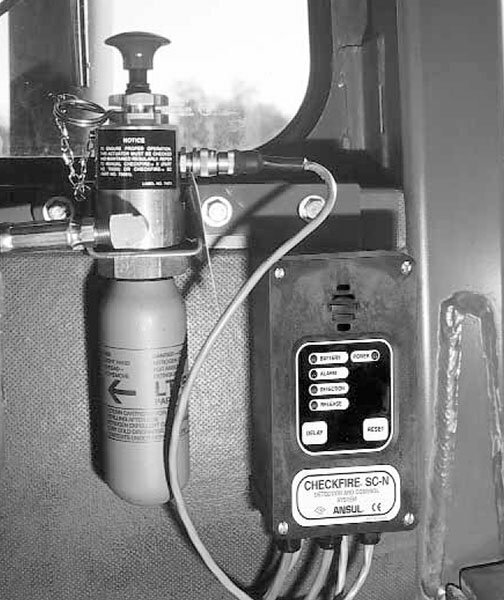 The automatic detection portion of the fire suppression system incorporates electric detection, either linear detection wire or spot detection. In addition, Triple IR flame detectors added to the linear or thermal detection circuit can be utilized for quick fire detection response. The fire suppression system is capable of providing local application hazard protection for mobile equipment and industrial hazards. In certain industrial hazards, total flooding can be used. The basic system consists of: Dry Chemical Agent Storage Tank(s), Expellant Gas Cartridge, Distribution Hose and Nozzles, Manual/Automatic Actuator, Automatic Detection System, and Accessories. 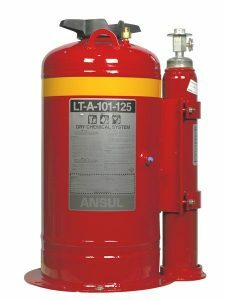 The ANSUL A-101 Fire Suppression System is an automatic or manual fire suppression system using FORAY® (monoammonium phosphate base) dry chemical agent for Class A, B, and C fires. 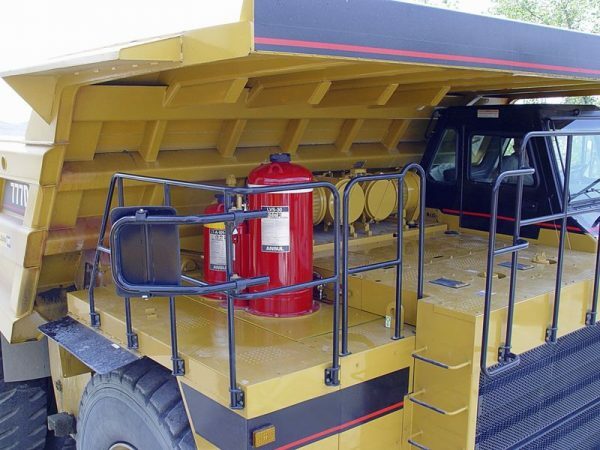 The fire suppression system is designed for use on large, off-road type construction and mining equipment (such as large excavators/shovels, draglines, haul trucks, wheeled loaders), underground mining equipment, and specialty vehicles (such as slag, pot and/or slab carriers, tunnel boring machines, solid waste handling equipment, and forestry vehicles). 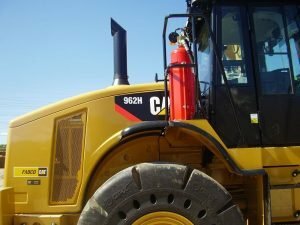 These types of equipment have large volumes of oils and hydraulic fluids under pressure. 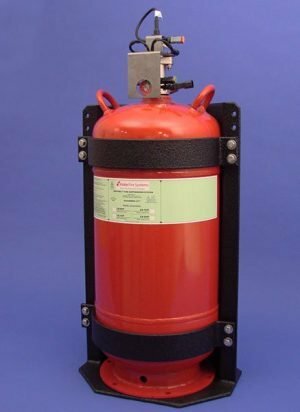 The fire system described is a suppression system only and is not designed or intended to extinguish all fires. It is extremely important that alternative firefighting equipment be available in case the system does not totally extinguish a fire. 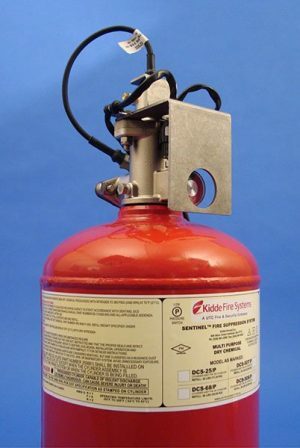 If an automatic fire detection and actuation system has not been supplied or has been disconnected, system actuation and discharge will not occur unless the fire suppression system is manually actuated. Canada (TC) Approved, and CE Marked. 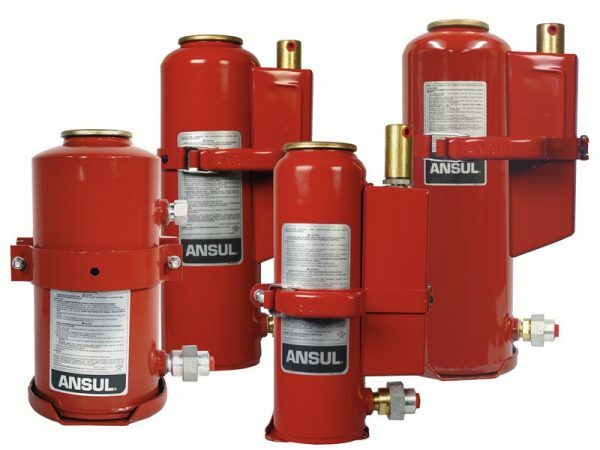 The LVS™ Liquid Agent Fire Suppression System is designed to be installed with an ANSUL A-101 Dry Chemical system to create a twin agent system concept that is capable of quick fire knock-down, coupled with the cooling application of the LVS liquid agent. The system consists of both dry chemical and wet chemical. 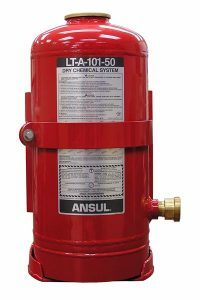 The dry chemical side of the system is the ANSUL LT-A-101 type system and the liquid agent side of the system consists of wet chemical tank(s) containing a premixed solution of LVS agent. Agent Storage Tank – The agent storage tank(s) consists of a welded steel tank, gas tube, brass or aluminum fill cap, agent outlet sealed bursting disc assembly, and instruction nameplate. Tanks for temperature ranges of +32 °F to +120 °F (0 °C to +49 °C) and the LT-A-101-10, have a cartridge receiver and an expellant gas cartridge located on the side of the tank. Low profile and extreme temperature model tanks, (-65 °F to +210 °F (-54 °C to +99 °C)), have a separate cartridge/pneumatic actuator assembly which is connected to the tank by a high pressure 1/4 in. hose. The tank is painted with a red enamel paint. Agent storage tanks are available in six sizes (10 lb., 20 lb., 30 lb., 50 lb., 125 lb. and 250 lb.). Mounting Bracket (10, 20, 30, 50) – Tank mounting bracket consists of a rugged, welded steel back plate and clamp arm assembly. The bracket is designed to retain and protect the agent storage tank in the normal hostile environment that these systems are installed in. The bracket is painted red enamel and can be mounted by bolting or welding. Mounting Ring (125, 250) – The mounting ring for the 125, 250 tanks is fabricated of 1/2 in. steel. The ring conforms to the outline of the tank assembly bottom. The ring can be welded to the mounting surface and the tank can then be bolted to the ring, using the pre-threaded holes in the ring. Expellant Gas Cartridge – The expellant gas cartridge is a spun high pressure cartridge containing either carbon dioxide for temperature ranges of +32 °F to +120 °F (0 °C to +49 °C), or nitrogen for extreme temperature ranges of -65 °F to +210 °F (-54 °C to +99 °C). Distribution Hose and Nozzles – The distribution piping (hose) network is designed to properly distribute the dry chemical to the nozzles. 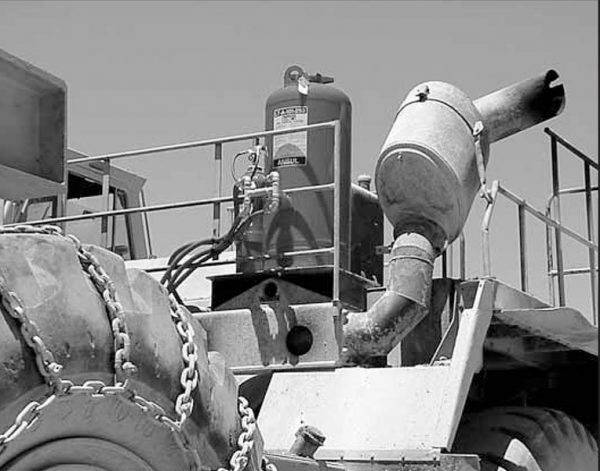 To survive the vibration found on mobile equipment, hose is used to distribute the dry chemical. In the A-101 pre-engineered system; hose sizes, maximum and minimum hose lengths, and number of nozzles are predetermined. There are three types of nozzles available for the A-101 system. Each type of nozzle has been designed and tested for various applications and area of coverage. Nozzle blow-off caps are available to keep the nozzles free of dirt and grease. Manual/Automatic Actuator(s) – The manual actuator consists of an actuator body, a nitrogen cartridge, and a mounting bracket. Two types of manual actuators are available: Remote type and Dashboard type. The Remote type uses either the “S” style bracket or the cartridge guard style enclosure. The Dashboard type uses the “L” or “S” style mounting bracket. 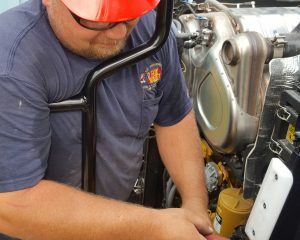 When the manual actuator is operated by hand, gas supplied from the nitrogen cartridge is released into 1/4 in. actuation hose. This nitrogen pressure then operates the pneumatic actuator that punctures a larger expellant gas cartridge (either carbon dioxide or nitrogen) and this fluidizes and propels the dry chemical from the agent storage tank. Automatic actuators (a component of the automatic detection system) operate the same way, except they can be operated automatically by the detection system. Automatic Detection System – Three automatic detection systems are available for use with the ANSUL A-101 fire suppression systems: CHECKFIRE Series I, CHECKFIRE SC-N, or the CHECKFIRE MP-N.
CHECKFIRE systems utilize either an electrical, mechanical, or pneumatic principle. 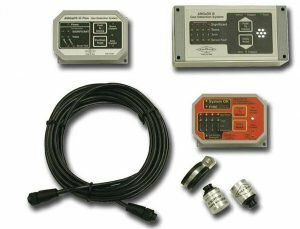 Four types of detector options can be used: A temperature-sensitive linear wire, a spot-type heat detector, or a gas filled stainless steel tubing, or a combined linear/spot type with Triple IR (IR3) flame detectors. Temperature-sensitive linear wire – When fire breaks out, the wire’s insulation melts, completing an electrical circuit and causes the detection system to actuate the fire suppression system. Spot-type heat detectors – Internal contacts will close when the temperature of the surrounding air reaches the set point temperature of the detector. This action completes an electrical circuit and causes the detection system to actuate the fire suppression system. Gas filled stainless steel tubing – When the gas in the tubing heats up, the increase in pressure operates a responder, thus completing an electrical circuit and causes the detection system to actuate the fire suppression system. The Triple IR (IR3) Flame Detector is a high performance and high reliability self-contained triple spectrum flame detector. This detector, packaged in a small, convenient sized housing for easy installation in tight areas, is specially designed as a general-purpose flame detector for off-road (mining) and industrial applications with the highest immunity to false alarms. The patented Triple IR design offers two to three times the detection distance of any conventional IR or UV/IR detector, scanning for oscillating IR radiation (1 to 10 Hz) in three special bands. Each sensor band pass has been selected to ensure the greatest degree of spectral matching to the radiant energy emissions of fire, and the lowest degree of matching to non-fire stimuli.